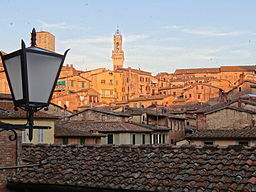 So this is a picture of Siena, a city in Tuscany in Italy. After a summer of teaching ESL at the American School in Switzerland in 1982, I rode with my friends Dani and Bruno by bike through the Appenines from southern Switzerland to Siena. Dani’s girlfriend, later wife, Marlies, was taking a cooking class there, and Dani (like all courting males) was eager to get to her. It took 10 days for the three of us to ride through the mountains. We climbed five peaks and rode like the wind down many mountainsides. We camped by rivers and sometimes stayed in old alberghi (hotels) along the way just to get the chance to bathe in a claw-footed bathtub. At the end of the 10 days, the adventure was over; that morning, Dani had gone to see Marlies and Bruno was out of the tent doing something. I sat alone amid the tumbled sleeping bags and half-opened pannier bags. It was raining hard outside, and the sky was full of leaden clouds, but I was dry. And I was shaking, on the verge of tears, as I looked out the door of the tent at the rain pouring down. Here I was, 27 years old, and I had no idea what to do next. I had just had the best adventure of my life. Already I knew that was true. This was not just indecision. It was a blank darkness before me, a total stoppage of my life right then and there. I didn’t know what to do. I didn’t know where to go. I had no one to go with me. It was me and the future looking balefully into each other’s eyes, full of inarticulate danger and anger and mistrust. Surely whatever I would try, I would fail. The world would spit me out like a piece of rotten tomato. I would cease to exist before I had existed. The fear knotted in my stomach like an animal crouching in my guts, waiting to consume me. As the rain slowly eased, I remained alone with myself in the tent, and I realized one thing: I couldn’t know the future, but it would happen anyway. It would come, and I would be there. The future was indeed a perilous darkness, but it was a darkness into which I must step whether I wanted to or not. I realized, too, that wherever I put my foot, there would be something there to step on, and with that step, the next one would be clearer. I realized that it didn’t really matter which direction I went in, because the direction would be revealed with each step into the future. I thought about this time just last week. As I opened the door into a hallway, I found a young student trembling at the end of it. She had stopped in front of a big steel door that led to another hallway, which in turn led to our classroom. She was afraid to go into the dark. She didn’t know that the lights in that building are set to turn on as soon as you go into the corridor, and that she only needed to go a few steps before the lights would illuminate her way. I put my arm around her and said, “Come on, it’s okay, you’ll see,” and suddenly I was back in the tent in Siena. Moving into the future. wonderful image. loving story. Yes. Thank you! Yes, you say it very well yourself. Our future is hidden in the darkness of our fears. As we take steps into the darkness, we find that the way is lit before us.